The National Japanese American Memorial to Patriotism During World War II stands on a small triangle of land just north of the Capitol between D St NW, New Jersey Ave and Louisiana Ave. 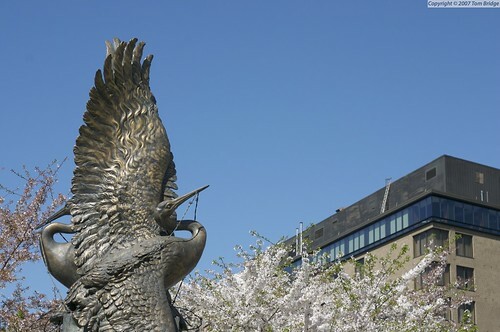 The beautiful bronze crane in barbed wire rises above the low cement landscape, a 14-foot statue designed by Nina Akamu, in demonstration of the Japanese-American’s plight during the second world war. While you might be more familiar with the larger World War II Memorial on the Mall, this monument stands in admittance of the difficult situation that Japanese Americans were placed at the start of hostilities against the Empire of Japan in 1941. By 1942, many Japanese Americans were placed in Internment camps throughout the Western United States, often in the midst of deserts and other wastelands. 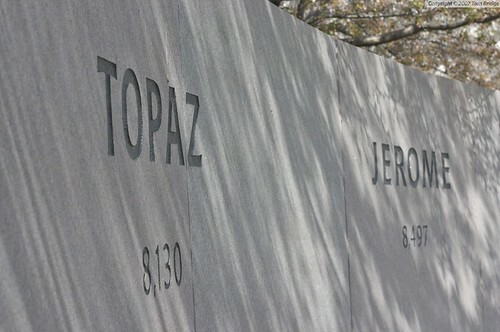 Their names, like Manzanar, Topaz and Jerome, are inscribed into the western retaining wall, along with the number of American citizens contained therein. Over 110,000 people, three quarters American citizens, were detained by the United States Government during World War II in these camps. The blanket actions were meant to discourage espionage by those who could be loyal to the Japanese Empire inside the United States. In 1988, President Reagan signed into law an apology on the behalf of the American Government to those who were interned in those camps, and paid out a $1.6B reparation to the families and survivors. The monument was built with private money on a parcel of land set aside for the “Go For Broke” National Veterans Association Foundation, named for the slogan of the 100th Battalion, made up of Japanese Americans serving in combat situations in World War II. The organization raised the necessary funds to have the monument built, and it was opened and dedicated in 2000. In 2002, it was given back to the Government, and is now maintained by the Park Service. I love the long temple bell that runs the length of one of the southern retaining walls of the monument. Its mechanical clapper sends a solemn tone from the lengthy bell, and sets the tone for the rest of the monument. It’s easy to just walk by the Crane Memorial, but the bell draws you in to see the memorial that contains it. While the reparations were painful, and there was shame in our apology, the contributions of Japanese Americans during World War II are impossible to ignore. The 100th Battalion and 442nd Army Regiment were two of the Army’s most-decorated units in the European Theatre. This monument was the least we could do. a week ago, i saw the japanese american memorial in dc on my washington dc trip.